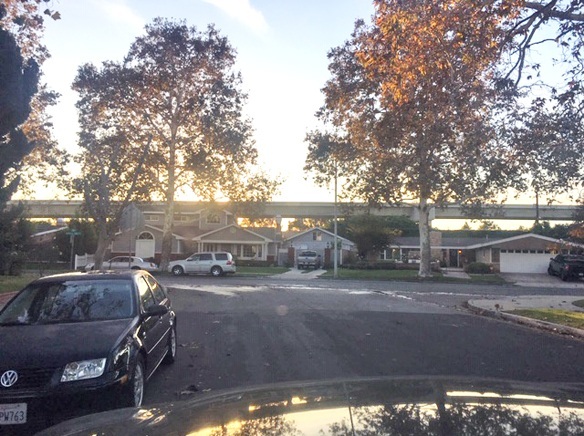 According to organizer Cindy Senteno, there are more than 3,500 homeowners in Rossmoor and the growing nuisance of sound pollution affects many of them. “We are making some noise of our own,” she said, adding that petition drives are accumulating more signatures and residents are becoming more focused on getting some attention from Caltrans. Residents are asking for improvements to the sound wall and a change in the Caltrans landscaping plan. The petition is requesting Caltrans “correct the improper height of the sound wall,” which they say was built over 26 years ago, and they want it rebuilt to 16 feet above the grade of the freeway at its highest location. Senteno, who lives near the overpass on the 22 Freeway and the 7th Street bridge, coupled now with the 605 carpool lane, said her backyard was once so quiet that her family hosted a backyard wedding there. Long gone, however, is that solace as recent freeway improvements were made and new improvements are underway, said Senteno. “Rossmoor residents were not included in any EIR or sound testing for this expansion project. Therefore, these 3,500 homes and residents, bordered by the 405 freeway and directly impacted by this project, having had no input request the necessary correction to the project which included, asphalt in place of concrete for the freeway lanes, to reduce sound pollution and use of dense, fast growing trees such as Brazil Pepper trees, not pine trees in all landscaped areas,” claims the petition. According to Senteno, the group is also hoping for enhanced responses from local representatives, including Sen. Janet Nguyen and Supervisor Michelle Steele, although the public officials did send representatives to their October public meeting on the crisis. She said the petitioners are very happy to have received support from Ralph Vartabedian and Rossmoor Homeowners Association. Senteno said former RHA president Beverly Houghton, was an early supporter and that support has been appreciated. The Rossmoor residents are pressing Caltrans for action as the agency ramps up their own internal investigation. Caltrans spokesman Van Nguyen promised to look into the issue and soon provide an update.